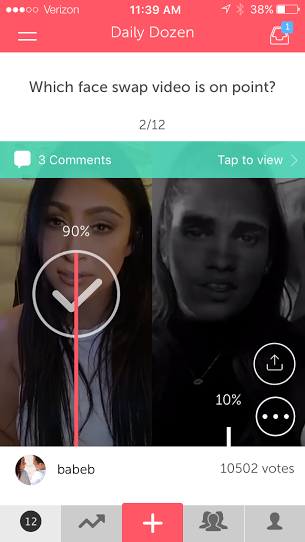 After throwing its backing behind a simple app for comparing photos and experiences geared toward a younger audience, Science is now betting that a simple way to compare videos is going to be one of the next big trends that will propel its app — Wishbone — to prominence. Wishbone is a pretty straightforward app. The company curates “cards” — photos laid out side-by-side that users can vote on which one they prefer. Usually it’s asked as a “would you rather” question, and the service puts a batch of cards out every morning and evening, notifying users when they pop up. The hope is to tap into a different kind of social sharing not seen on other networks. But the next big push for the company will be video — which makes a lot of sense. The way people use apps and mobile devices is shifting in such a way that the lion’s share of mobile internet traffic will likely be video content. Facebook is investing a lot in mobile video tools like Facebook Live, and of course there’s Snapchat, for which video is a huge part of the user experience. Uploaded videos will line up side-by-side in the card. Users can upload videos, or shoot 10-second videos that they’ll upload. Users then — like with photos — vote for which ones they prefer. Like traditional Wishbone cards, the best user-generated video content polls will show up in the daily and nightly batches that are featured by Wishbone. Wishbone isn’t necessarily the most popular app in the app store, and Jones says the app is going after a different style of sharing than other social apps. But it also hasn’t hit the kind of runaway success that those other apps have hit — at least, not yet. It sits in the top 150 apps, but as most mobile traffic and content shifts to video, it might be possible for Wishbone to tap into a new user trend that could help bolster its presence on the app store. The app comes out of Science, an investment firm and incubator of sorts that works on a bunch of things simultaneously and then makes big bets on the ones they think will be successful. There is a differentiator with Wishbone compared to other social networks, Jones said. The guest user experience is just as important as the registered user experience, with the goal being that it’s very quick to onboard new users and get them engaged with the app — and coming back every day. If Wishbone is successful with that, it can start generating revenue by placing native ads (cards that are sponsored by companies, basically) within the app and start scaling into a real business.